The Galaxy Note series has always seemed like an experiment gone unexpectedly right and some of that is due to Samsung always packing the greatest specifications into the device coupled with the exclusive S Pen. The Note series has always drawn attention to those who love big screens and need the most powerful internals and it is safe to say this time around the response should be no different. However, things are not all bright and sunny for the South Korean company. Earnings reports of the last quarter show declining profits and an overall slump from last year in both sales and money inflow. The Galaxy S5 failed to sell as well as its predecessor and was in fact a victim of Samsung’s own reputation as the device failed to offer the outlandish expectations created by numerous rumours. With declining market share and falling revenues, analysts state that Samsung looks primed to make a BIG impression with their big handset. 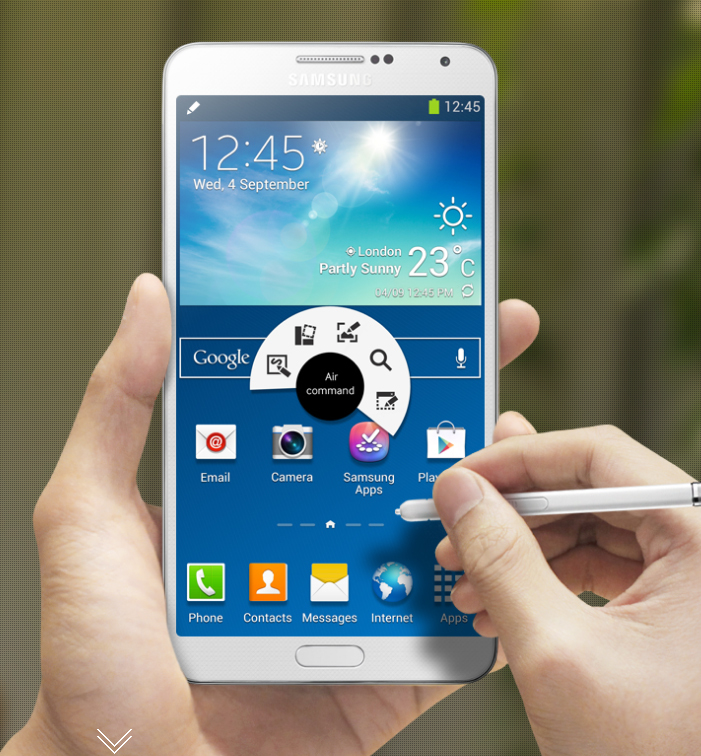 The original Galaxy Note made headlines for one main reason – its huge display. The old 5.3” display may not seem like a mammoth in today’s time but it began a trend that saw smartphone displays escalate to epic proportions. Most rumours point to Samsung opting to stay with a 5.7” display instead of scaling up to 5.9”. This move makes sense as the 5.7” formfactor turned out to be the sweet spot between huge and still usable.. What most people say is a sureshot for the Note 4 is that it will come equipped with a quad HD display. Super AMOLED has recently evolved to a completely new level evidenced by the display prowess of the Tab S so it leaves us eager to observe the ultra sharp display. On the wilder side of things, there have been plenty of rumours going around claiming that Samsung will put a sort of curved or wrap around display on the Note however it seems unlikely as of now. Even so, if such a curved display technology were to be used anytime soon then it is assumed Samsung would test the market using a standalone device similar to what they did with the Galaxy Round. The Note line has never really been too much about design with the most “revolutionary” design change being the use of plastic to give a faux leather look. That may change this year though. As mentioned before, Samsung is not in its desired financial state and is losing out on market share so the new Note seems primed to be the company’s ticket back into the game. To really make an impact, Samsung just might ditch the highly criticised plastic for more premium material choices. We are not saying that they will make a metal device, rather they may use higher grade non glossy plastic somewhere along the lines of what we see in Lumia devices. Nevertheless, there have been rumours pointing towards the company releasing not one but two devices which have distinct differences in design. 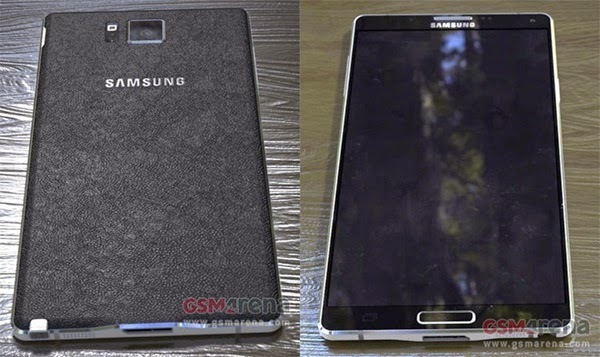 A recent leak from an anonymous tipster however shows the supposed Note 4 with a metallic frame and chambered edges similar to what we saw on leaked Galaxy Alpha designs. Bare in mind that the frame alone appeared metallic whilst the back cover looked like plastic or another material. Whatever the case is, it is about time that Samsung brings in material changes to its devices because it is obvious enough that the build quality is not popular among consumers and critics alike. Aside from changes with the build, the new device is expected to pack a heart rate sensor and fingerprint scanner similar to the S5. Additionally, reports claim that the device will also sport a sort of UV sensor along with IP67 certification. Some other expectations are a slimmer frame and thinner bezels. I was wondering whether a separate segment for the S Pen is justifiable but then you come to realise it is an exclusive accessory that comes with the handsets and adds unique functionality not found on any other Android device. The S Pen has not evolved significantly since its inception however it has gradually been redesigned and improved upon over the past two years. This year seems to be no different as we expect the S Pen to be more accurate than ever. The main point of this segment is to question what new functionality (if any) will we see for the S Pen. Sadly this section is where we have virtually no information which is rather frustrating and leaves us wondering whether there will be any new additions. All Note devices have been specification monsters, always raising the bar for the rest of the industry to follow. May be this year will be the first time that the Note does not feature over the top specifications, contrary to analysts’ saying that Samsung needs to wow the crowds. Various leaked benchmarks have popped up over the past month and most of them show more or less the same specifications. 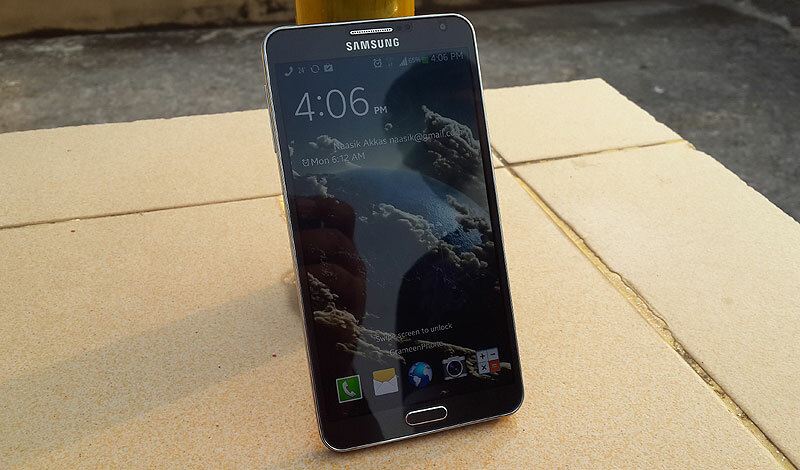 Although early rumours claimed the Note 4 will come with a 64 bit chip (Snapdragon 808 or 810), the leaked benchmarks say otherwise. One revelation that was expected is that there will be two chipsets. One with a Snapdragon processor (likely for the USA only) and one with an octa core Exynos processor (International variant). 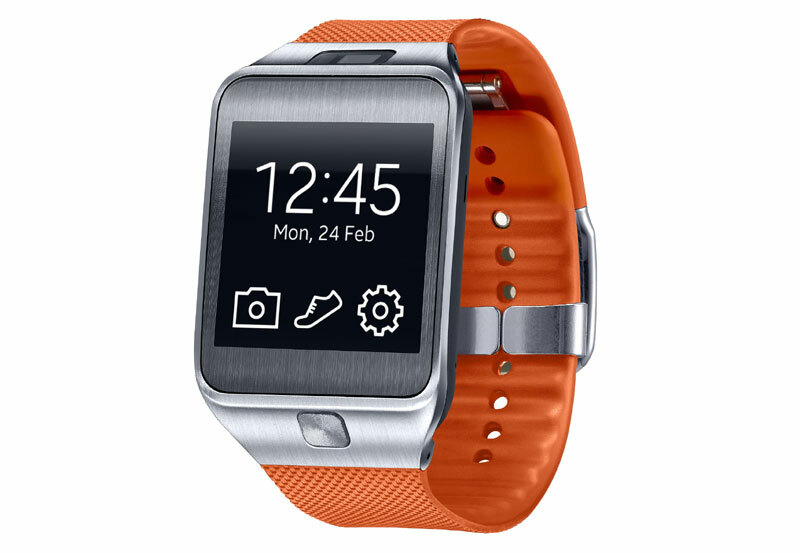 The Galaxy Note 3 released alongside the Galaxy Gear and both devices were marketed together and also sold together in some cases. With this year’s launch, Samsung is expected to unveil the Gear VR, a virtual reality headset powered by your smartphone. Although details remain scarce, leaked pictures have emerged showing the design. Usually Samsung has unveiled the Note smartphones at IFA at Berlin but Samsung has uncharacteristically sent out invites for an event on September 3rd, just before IFA with the tagline “Note the date”. The invite more or less makes it clear that the event is for the Galaxy Note 4. With rising pressure from Chinese competitors and falling revenue, the Galaxy Note 4 may be Samsung’s ultimate device to revolutionise instead of just evolving. This may well be THE Samsung smartphone that sets the tone for the future of Android devices similar to what the Galaxy S2 and the original Note did a few years ago. We can not wait until September to see what exactly does Samsung have in store and will cover the device’s launch in great detail.